Description: This map detail is from a facsimile prepared for the Library of Congress by Jose Luis Gomez in 1914. It is from a 1742 map by Antonio de Arredondo, depicting land claim disputes between Spain and England. The extended title of the map is "e;Descripcion Geografica, de la parte que los Españoles poseen Actualmente en el Continente de la Florida, del Del Dominio en que estan los Yngleses con legitimo titulo solo en Virtud del Tratado de pases del año de 1670 y de la Jurisdicion que indevidamente an Ocupado despues de d[ic]ho Tratado, en que se Manifiestan las Tierras que Usurpan...."e;. The map shows the Spanish territory as defined by a treaty made in 1670, including coastlines, European and Native American settlements and forts, and pictorial representation of mountain ranges. 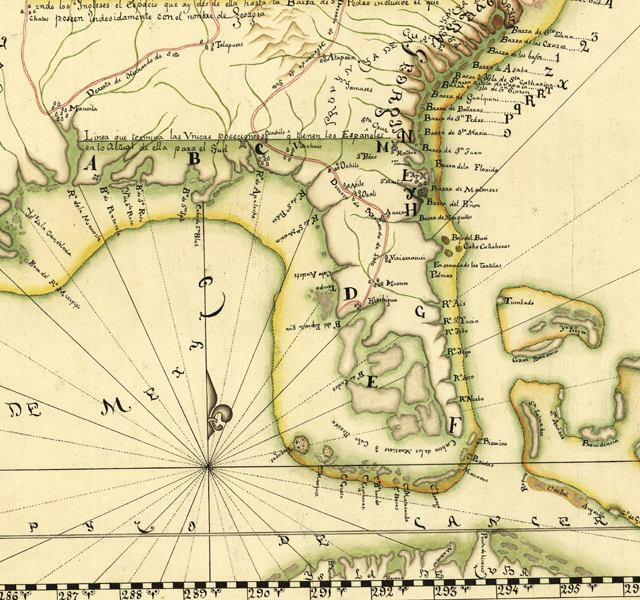 A red colored line in the map indicates the route of Hernando De Soto's sixteenth century entrada from the west coast of Florida into the Southeastern part of the United States.